As you may know, when I first started this blog it was like many of the bloggers out there, on a whim. I had decided that i wanted to do something creative. I already had a (very dusty from lack of any attention) sewing machine and so sewing seemed to make sense, especially as i didn't need to spend much money. A google search for beginners projects led me to Tillys site. I read it from beginning to end. I then read some other blogs. My favorite are listed on the right hand side if your interested in some good reads. I then took the plunge and thought I would blog. The main two reasons for blogging were to keep a diary of my makes- success and failures and to encourage me to make more as it documents the date. Well I've been blogging now since January and one of the things I've done since then is to only make using independent pattern designers. 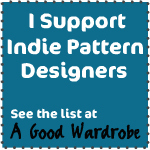 I feel there are some truly stunning and beautiful things to make from the independents. The instructions are much more beginner friendly and many come with a wealth of resources that can be plundered. Colettes invisible zipper video being one of my all time favorites. So I heard about Tillys Vimeo video on blogging and thought I would give it a watch. It came from the Folksy Summer School which also looked fab and I would love to attend next year. Tilly talks about how to make your blog really good and she ought to know. One of the tips that I have picked up is the notebook idea. Beautiful in its simplicity, it really is a structured way of blogging Up till now my blogging has been sporadic and led by making. So when I make something I would then blog about it. But this means that if i haven't made anything, well I haven't blogged. This a led to double guilt aggggghhhh!!!!. Guilt over not making and guilt over not blogging. With the notebook firmly in place I should become guilt free. If you are interest in watching this video I have added to the link here. If all goes well I will be back Thursday pm. Quick mini update - for more on being a better blogger read Majos's post too, a good read and what amazing timing, thanks Majo Look forward to reading your schedule too. Thanks for the link, some good ideas. I've only just started blogging, and am also quite new to sewing, but it's all very exciting. I've read your blog lots of times but could not work out how to comment without a URL to put in! I shall pop back on Thursday. Hello, glad you've left a comment its nice to hear from those who read my blog and I do appreciate that you've spent some time to say hello. I can honestly say that I really do love both sewing and blogging and its all made so much better when someone comments. I'm glad you liked the link too I for one found it really useful.